For those of you interested I will be at the Nats with some of my gravity class cars and equipment. If there is interest I might be taking orders for a short run of scratch built gravity cars. I will also have dates for the Midwest series where these are raced. Your cars were a blast to drive on the Car Model Magazine track. They were just amazing. I think our conversation went well with Peter in regards to the Parma track restoration using non magnetic braid. Hope to have additional discussions with you soon regarding this class. When the Parma is completed I'm hoping that you, Al and Pat can come out to Lenjet and run on it. Thank You. Location: Nantasket Beach, Hull, Ma. I did not drive 1, but I watch others drive them. I also got a chance to look close at 1. Thanks John and Mike for the kind feedback. The Parma track rebuild certainly is being being done first class with great attention to detial. I look very much forward to getting out and driving on it. The Lenjet facility has so many high quality and historic tracks that the Parma track will fit quite nicely with. While I am very passionate about the Sidewinders that I build and they are a competetive platform, as you can see from the above they are just one of the fold as far win/losses goes. They drive like a 24th scale wing car and when someone marshall's them they usually hesitate to put them back in the slot and "ask what is this?" It makes for good converstation, but slow practice! Check out LANDSHARK 2013 for ready to race Gravity cars and kits. A pick up based AFX pan by Doug Morris with my high ratio gear plate. Doug Morris's Tjet that finished 2nd at the Midwest Championship. Thanks for the photos Joel. Just an update on the Parma 1972 National ( Brass Wars) Championship track. As you know and with your help, Peter Lentros went from a magnetic braid to a non magnetic braid to be installed on the track. The non magnetic braid recently arrived. A few days ago, Ron and Tom routed a piece of practice particle board and installed some braid on it. The height came out a perfect .005 which was the desired height. The sticky tape used to fasten the braid worked perfect and very difficult to remove once installed. This should make for a very good bond from braid to track. A little more testing will be done before the track is routed for the braid. Thank You. Thanks for the pics of Doug Morris' AFX cars. Very, very nice! Several different types of scratch built cars have appeared in the Series. Certainly this is a very exciting category of cars. Principal builders of these cars have been Tim Miller, Brian Fleischmann, Scott Terry, and myself. All of these cars have featured a mini-motor, but otherwise were distinctly different from each other. Tim, Brian, and Scott designs were all of the inline variety. My design was of the sidewinder style. Of this group of cars only the sidewinder has won races, that being one in the series and one at the Midwest Championship this year. Design and development of this category of car requires time and patience to be competitive. The sidewinder design is in its third season. The origin of the base platform came from close collaboration with Pat Dennis. 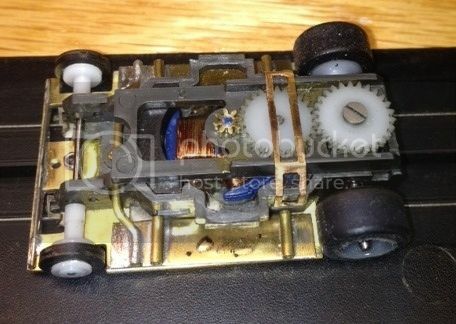 The chassis design mimics successful 24th scale class cars. 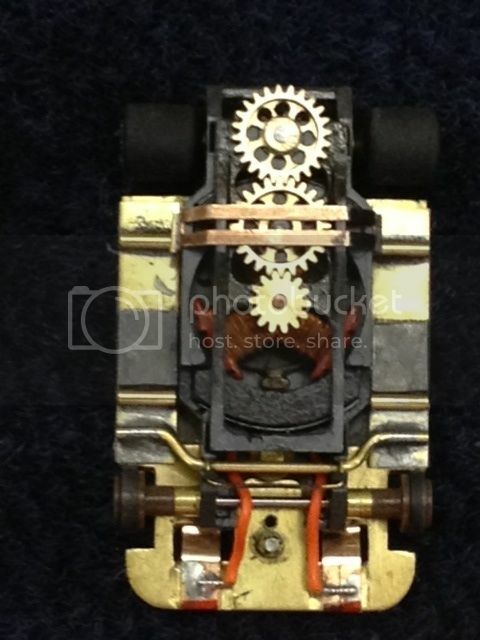 The motor is a modified M can design based on some very original thinking on Pat’s part. I have tried various winds in them over the last several seasons and found that between 4 and 6 ohms armatures give the best performance. The motor in the Midwest Championship car was a 6 ohm 40 gauge wind. I have varied the gearing in the cars between 8/23 to 7/24. Currently under average conditions I prefer 7/23 gearing, as it seems to have the best balance. If there is interest I would be glad to show more pictures. Tires and traction are big deal with the sidewinder, as they are for all gravity cars. The straight line speed of the sidewinder is exceptional; getting that to the track is challenging. A clean track makes a huge difference, but this is not always something the racer can control. The heaver cars do better under “dirty” track conditions - advantage AFX and Riggins at 22 grams plus. The sidewinder and Landsharks seems to perform best at around 18 to 19 grams. Rick DeRosa and I are both working on variations of tire compounds and coatings to deal with “dirty” track conditions. Our tire challenges here are much the same as they are for T-Jet racing. The amount of work being done on the 1972 Parma Brass Wars National Championship track has been incredible. If you saw the track two years ago when it arrived at Lenjet versus how it looks today, you would be astonished with it's transformation. Peter Lentros and his band of talented men have done an incredible job so far. 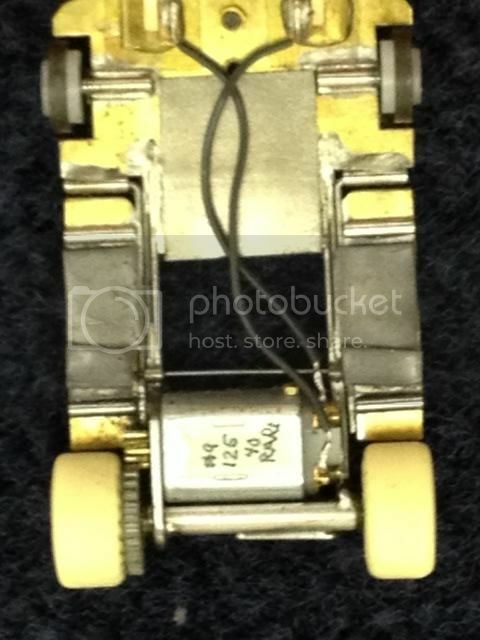 Tom Smith developed a real cool miniature wood plane so that the track can be re-routed for the new non magnetic braid. Ron did a great job with the routing of the surface as well as completing the leveling of the track surface which he has now completed. If I'm not mistaken, the track surface will be painted sometime within the week. Once this is done, the braid will be laid. Were getting there slowly but surely. Can't wait to take some laps on this bad boy track. Thank You. I'm heading out to Lenjet today. The 72 Parma track received it's first coat of surface paint. The original color was a very deep olive color. A color was chosen to match it as close as possible. I'm going to check it out. Next step will be the braiding. if he using cut down poly mags, then he maybe using the BRST mags??? if so, the naco mags are stronger. I think they have both t-jet size mags and magnatraction size mags. if he still makes them?? I just got back from lenjet. The dark green olive surface looks very nice and very close in color to the original surface.